POLL: Industrial style - still hot or not? Apart from the Scandinavian insurgence, no style has perhaps become more popular in recent times than the rugged, bare look of all things industrial and warehouse. Leaning on everything brick and reclaimed, exposed and organic, it's a style that is undeniably unapologetic and eye-catching, hence the mass appeal. But like all trends and styles, is its time coming to an end? 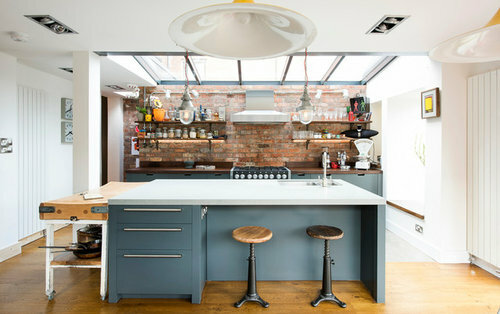 Arguably a little ubiquitous now, do you think industrial style is still hot or not? Vote and comment below! I think it depends on the space, I do like the industrial look and you can take this as far or as limited as you like really..... It's a matter of taste of course but then this has nothing to do with what is popular.. I'd rather see something that was fabulous and befitting rather than done because it's popular.. Notice I don't use the word "trendy" I hate it and it has no place in design.. I think design should be lasting, beautiful and most of all a reflection of the client or person wanting the look and the space..
Great to contrast industrial with natural / rustic materials. Keep an eye out for our latest blog coming soon on industrial style furniture. We are moving soon, the house has a shaker kitchen in stone with very sleek contemporary taps, sinks and handles. I was initially going to go industrial with the accessories throughout the house, starting with some stools in the kitchen. However, just bought two taupe Natuzzi sofas half price, fell in love with them and now going for a more grown up, Italian classic/contemporary style instead (which I feel will work with the handles/taps in kitchen better as well as going with lamps we have). I quite liked the industrial look, but felt a bit young and maybe overdone as well (every cafe now seems to have this look)? Glad to now be going for something more sleek/contemporary/classic which is actually more us. Use lasting high quality materials such as stainless steel wil ensure your project is timeless and lasting. I love industrial or urban style, only use a few touches though. Personally I think it depends on the weather of the city you live in and the orientation of your flat/home. If your windows allow for lots of light, particularly in the kitchen and the bedroom, then industrial is chic and sophisticated. However that may change to dark and dreary if you don't have the ability to capture light; industrial could have the effect of feeling like a factory. Still hot, combine with other styles for an eclectic look . We really love the industrial style! It really is good to see something different, and a little heavier to add impact to your home. We love the Industrial look and have used it as shelving in our own showroom. Its raw honesty combines well with more luxurious products, we have the shelving next to a Rossini velvet sofa from Mulberry and it looks fab. Mixing styles shows personality. Industrial styles have changed but are still very fashionable in certain style houses. We think the industrial look is great because you can mix it up with contemporary styles too and it will fit in with most looks you are trying to achieve. Industrial look is great way to mix different design elements and textures - combines traditional with contemporary. Love it! Absolutely - industrial can work well in a variety of different style homes. I voted yes, I have a very tasteful luxe project in progress. Concrete with beautiful natural materials and lots of oversized windows to let light flood in. Voted yes, as I love the warmth it brings mixing up the old and new. I think it's a fantastic look and so adaptable. There are big moves in introducing a luxury edge in to the industrial style. Also many scandi looks are often verging on industrial. Love me a bit of wrought iron and Edison bulbs. I like mixing old and new materials when creating industrial style pieces and I think this keeps it fresh. I love mixing the old and the new, so of course we need the new. I think it highly depends on the space and the products used. If it is inclined towards being hipster, that style is getting old. But there are ways to keep the industrial style fresh. POLL: What's your favourite interior style?